The library depicted in images 6065.1 through 6065.3 illustrates some of the reasons we remain so thoroughly engaged in our craft. A few years ago, a client approached us with a dream from her youth spent in Charleston, South Carolina. As a child, she was enchanted by the rooms full of books in Charleston’s finest old homes, along The Battery. 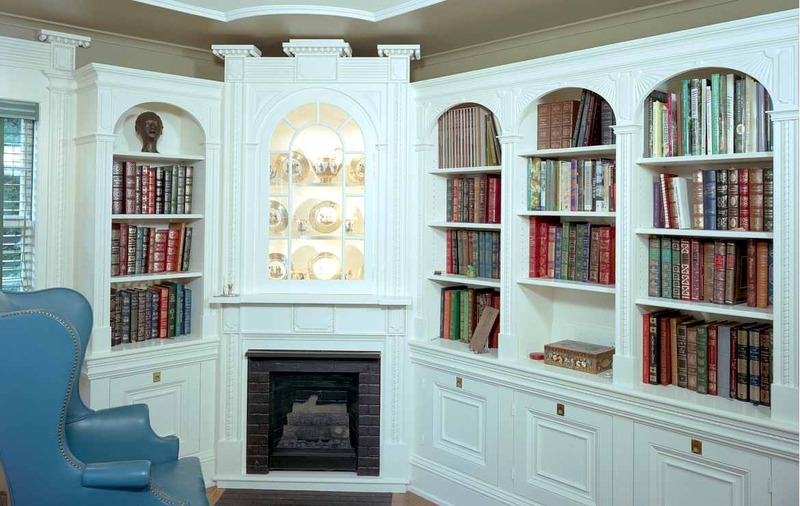 Years later, in another room, in another state, she asked us to create a re-proportioned version of one particular historic, Charleston library. We were delighted. The new library is a perfect example of work best suited to the skills and design expertise of our truly custom cabinet shop. Weaving the various decorative elements of the original library together with the requirements of a modern home, proved to be an exciting and technically challenging project for our shop. It helped, of course, that we already had an intimate acquaintance with Charleston, and had previously visited the very library of which our client was so fond.